Best flooring for a kitchen. What is the best kitchen flooring. Choosing the best kitchen flooring might be not as simple as it looks like because of many different products with its unique properties available from flooring manufacturers. Not only design and appearance of particular material will determine what will suit the best in the kitchen, but there are many other factors which should be taken in to consideration while shopping for your new kitchen flooring. Kitchen is very often a heavy traffic area especially in a big family and durable flooring material is often essentially important. Also during meal preparation it is always a big chance of liquids, some food, or even sharp silverware fall from kitchen countertop and it is always a potential risk of damaging the floor. Using a tile as a kitchen flooring covering is the most durable option. Glazed ceramic or porcelain tile is nearly maintenance free option and will last for many years if properly installed. Any stone tiles require periodical sealer applications, but naturally beautiful marble, granite, limestone or slate tile will least susceptible to damages. With highest moisture resistance and easiness to clean tile is one of the best choices for any kitchen. Bamboo is one of the most popular flooring for modern kitchen design. Manufacturing bamboo flooring doesn’t harm our ecosystem and with a distinct natural appearance it is a good alternative to wooded floors. Natural vertical or horizontal bamboo is harder than many species of wood flooring. Carbonized bamboo available in many different shades and adding pigment during manufacturing allow making a product in variety of colors. Cork flooring will require more care and might be scratched or damaged with sharp objects, but it very suitable even for a busy kitchen area. Its softness and unique appearance of surface layer makes the cork a very good option for covering kitchen floor. Hardwood floors are made from timber and have been using as a flooring covering for centuries. Wood flooring is one of the most beautiful options for a kitchen. It is durable and long lasting material, but due to its nature it might be damaged with excessive moisture. Scratches and minor dents might be eliminated from the surface of solid and some engineered hardwood while sanding out the top wearing layer of the wood during refinishing process. Stain application will allow changing the color to match the floor with any kitchen design. Hardwood floors are relatively easy to maintain and with a minimum care will satisfy most of family requirements. Price might affect a decision which option to choose while shopping for new kitchen flooring. Linoleum and vinyl are on the top of a list when it comes to the cost. With a high water resistance and variety in colors and styles vinyl tiles or bigger sheets of linoleum is a perfect choice to consider while budget is low. Laminate is another budget-friendly option. Quality laminate is harder than natural wood flooring. Floating floors are relatively easy to install what makes the laminate very attractive to many “handy” homeowners who can manage the installation by themselves saving on labor. 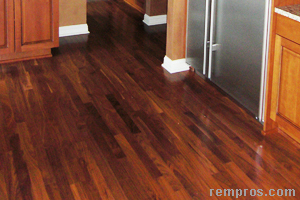 Unlike natural wood laminate flooring is a man-made material and it cannot be refinished. Badly damaged plank in the middle of a kitchen might be impossible to repair and hard to replace.